Houston--On May 28, the Houston Church of Scientology celebrated the 61st anniversary of the launching of Dianetics by L. Ron Hubbard. Directors from the local church recognized Muhammad Mosque No. 45 with the Top Field Group award for having 36 total Dianetics Auditors and over 1300 combined auditing hours. The top three individual awards for the most auditing hours were presented to Student Regional MGT-GCC Captain Valerie Muhammad (223hrs), Byron Muhammad (139hrs), and Ebony S. Muhammad (100hrs). During his Saviours’ Day address in February, titled “God Will Send Saviours”, the Honorable Minister Louis Farrakhan said he found this modern tool called auditing while visiting the Church of Scientology. Auditing is a process of listening and helps people return to painful experiences that are hidden in the depths of their minds or have been ignored. “Auditors listen and when they listen and not talk, they help you to come up with that which would relieve you of your own pain by bringing you back to it, causing you to face it, confront it, handle it, that you may be freed from it,” said Min. Farrakhan on Feb. 27. During the local celebration, directors presented the history of Mr. Hubbard launching Dianetics in 1950 to how it now has become a technology used by millions throughout the globe. Sister Valerie was invited to speak on behalf of the mosque. “The Honorable Louis Farrakhan expressed his desire is to see over 1000 trained professional auditors in our nation. When he said “Be,” the Believers responded, “It is!” Many Believers put their lives and businesses on hold to begin this training, sometimes travelling 3 -4 hours one way to the nearest church. Over the past eleven months we’ve witnessed restored eyesight as a result of Dianetics. I’ve seen confidence renewed and marriages revitalized after participation in auditing sessions,” Valerie Muhammad told the audience. “On a personal note, each year Mother’s Day marks the anniversary of the last time that I saw my mother alive. For the first time since her passing, I was able to enjoy this past Mother’s Day with my siblings as a day of celebration–no sadness. 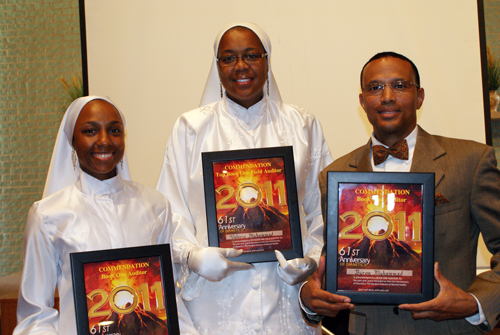 I offer my sincerest thanks to the Honorable Minister Louis Farrakhan for his divine guidance and continuous demonstration of love for us and for allowing us to experience the technology of Dianetics without reservation or hesitation,” she said. “I bear witness that this is the right tool that Allah guided the Minister to. As someone who has studied psychology and therapy, I see a dramatic difference in not only the delivery of therapeutic sessions with Dianetics, but more significantly the results immediately following an auditing session. I have experienced those very same results every time I've been audited,” said Ebony Muhammad.